Last week, I did a brief post asking if anyone knew why the horizon problem was a problem since the universe had started as an infinitesimally small point. I received a lot of excellent replies, which I’m grateful for. I had a couple of people ask me to post any answer I might eventually find. Unfortunately, I haven’t found an explicit authoritative answer, but after reading the responses, as well as diving into papers, that were technical way beyond my league, I have what I think is the answer. To review, the horizon problem refers to the particle horizon, also known as the cosmological horizon. This is the largest distance over which matter or energy could have interacted since the start of the universe. This limit exists because the speed of light is the ultimate speed limit of anything within the universe. Nothing can travel faster than this speed, including particles, field interactions, or even gravity. The universe is about 14 billion years old, which puts a limit to how far into the universe we can see. Due to the expansion of space, we can actually see further than 14 billion light years: out to about 46 billion actually, although due to the finite speed of light, the farther away we see, the further back in time we’re looking. So at the limits of our observation, we’re not seeing the universe as it is today, but as it was 14 billion years ago. Around 380,000 years after the big bang, the universe’s density lowered to a point that light could travel, releasing a pent up store of photons, causing an enormous universe wide flash. The expansion of space since then has stretched that flash of light into the microwave bands. The cosmic microwave background is the furthest thing we can see in space and time. 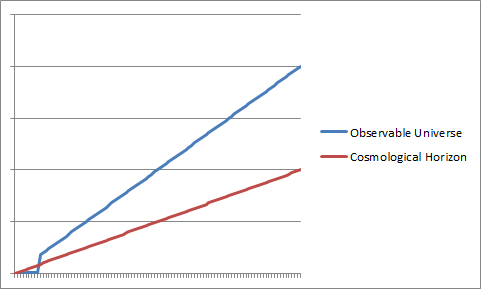 So, the cosmological horizon then is currently 46 billions light years. However, we can look in the opposite direction and see just as far, another 46 billion light years. That makes the observable universe 92 billion light years in diameter. The observable universe is twice the diameter of the cosmological horizon. The thing is, the cosmic microwave background has a consistent temperature in both directions, with only the most minute variation. It’s as though they were in or near thermal equilibrium, but they are outside of each other’s cosmological horizon. Getting back to my original question, if the observable universe started as an infinitesimal point, wouldn’t it have had an opportunity to reach thermal equilibrium back then? The answer, I think, is that under the classic big bang timeline, the cosmological horizon was always smaller than what is now the observable universe. Not to any kind of scale. Traditional big bang expansion. Given the classic understanding of a smooth expansion, at no point in the history of the universe was the cosmological horizon ever larger than what eventually expanded into the observable universe. The horizon started less in size than the observable universe and was never able to catch up as they both expanded. Even one planck time after the big bang, when the cosmological horizon would have been one planck length, what is now the observable universe must have been two or more planck lengths in diameter. The matter and energy across the observable universe never had a chance to reach thermal equilibrium. This is one of the reasons that Alan Guth postulated cosmic inflation. For the horizon problem, the magic is the short period before inflation, when the expansion was slower than the traditionally understood rate. This allowed the cosmological horizon to be bigger than what is now the observable universe, allowing thermal equilibrium across it. This is followed by a period of exponential expansion where space rapidly expands by many orders of magnitude, spreading the thermal equilibrium to everything we can currently see (and probably far beyond). Not to any kind of scale. 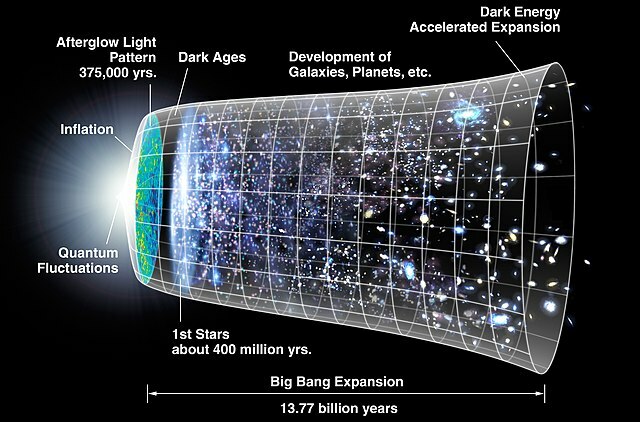 Big bang with cosmic inflation. It’s worth noting that although nothing within the universe can travel faster than light, this prohibition doesn’t pertain to space itself, which can expand faster than light, or to the relative speeds of distant objects carried along by that expansion. Indeed, given the acceleration of the expansion of space, there is a limit to how much of the universe we will ever be able to see. Everything beyond that point is moving away from us faster than the speed of light. We are forever causally disconnected from those regions of the universe. Of course, the horizon problem isn’t the only thing that cosmic inflation solves. It also helps with the flatness problem, and other problems such as the observed absence of magnetic monopoles. For a more in depth discussion of this, I recommend Ethen Siegel’s excellent post on cosmic inflation. I hope this post is clear to my fellow learners, and that it does justice to the insights of those who responded to last week’s query. Thanks again to everyone who participated in that discussion. I learned things, which is always awesome! At the same time, if there are any physics experts out there who see misconceptions here, I’d be grateful to hear from you. This entry was posted in Science and tagged Alan Guth, Big Bang, Chronology of the universe, Cosmic microwave background radiation, Horizon problem, inflation, Metric expansion of space, Observable universe. Bookmark the permalink. As far as I understand it, your account is good. Well explained too. I think the graphs help. I was thinking of doing something similar but proved to be too lazy. In the end it probably took more time to communicate the same ideas with words! I’m not sure this description is particularly accurate in the picture it evokes. It seems to indicate that if you were there at the time you would have seen a sudden flash at this point, which is not the case as far as I understand it. You would have seen massive amounts of light before this point and massive amounts of light after this point. The change was in how far the photons could travel before getting absorbed (allowing the perception of images of distant objects) but there would have been (short-lived) photons everywhere since the beginning of the universe. If anything the universe would have got darker at this point. The transition was of reducing opacity – from solid white to somewhat foggy to progressively clearer. So it’s not that we’re seeing a sudden flash of light. Instead we’re seeing back to the time when light was so pervasive yet transient that no distinct images could form. The diameter of the cosmological horizon, if that has any meaning, is the same as the diameter of the observable universe. I think it would be better to say that the diameter of the observable universe is twice the distance [of/to] the cosmological horizon. DM, thanks for the feeback and kind words! I’ll definitely grant that it probably wouldn’t have been a big flash as we understand the term. Probably more of a giant release or radiation lasting several human lifetimes, although I’m speculating on this. Good point about the diameter of the cosmological horizon. I struggled with a good way to get the point across on that and had to use language that was imprecise, but hopefully effective. Well, that can’t be right, because it is impossible for photons to be stationary. As massless particles they can move at no other speed than c. Whenever they appear to be moving slowly it’s because they’re being absorbed and re-emitted. I’m pretty confident that in the early universe they were flying all over the place but were absorbed rapidly. Actually you’re right. Poor language on my part. The photons were being emitted and absorbed by protons and electrons which, due to how close together they were, didn’t allow those photons any room to travel. When the density lowered enough for neutral atoms to form, the photons suddenly were able to fly without immediately being absorbed, leading to a huge release of electromagnetic radiation, which has been cooled and stretched into the CMB. Thank you. This effort, your effort, is greatly appreciated. I wish i understood any of this. More specifically about one of the reasons commonly cited for why cosmic inflation ( http://physics.about.com/od/astronomy/f/InflationTheory.htm ) is thought to have happened: the problem of the universe being the same in all directions, called the homogeneity or particle horizon problem. Thank you for taking the time to assist me in understanding! If you know of any other (preferably free) resources good for laymen, let me know. Thanks! Glad you found them helpful. About.com and HowStuffWorks.com are pretty good resources for getting started on topics. en.Wikipedia.org can be good, but often not for beginners. simple.wikipedia.org can be good, but often it’s so simple as to not be useful. Let’s say the universe started at 1 planck length, and the radius of the universe doubles every n, what is the minimum n which can achieve homogeny in the observed CMB? The time required for energy to travel from one side to the other is 1 Planck time, Pt, but in that time, the universe radius has increased in size 2^(Pt/n). In order for the energy to be able to reach this new boundary, what must n be? d = tc = 2^(t/n) + 1/2 Planck length \\half a Planck length because the origin has a head start on the border. t is variable because the duration of homogenization is unknown. For example, if you want the far reaches of the universe to mingle until 10 Planck time, after which the rate of expansion will exceed the speed of light, then n must be greater than 10/log(2)9.5, or 3.079 Planck time. The lower limit on n would seem to be about 2.205 Planck time. Fair warning: it’s been a long time since I did anything like this. Thought came up while doing this. Unless the universe is contained, as in a particle, there will be a fuzzy edge to it, because energy does not only travel toward the origin. This would imply that there are locations in the universe which do not appear homogenous. Wow! I’ll have to take your word for it on the mathematics. From what I understand, inflation is usually thought to have started around 10-35 seconds (no idea how they calculated that), which appears to leave a lot of room for n. And that if we could see far enough into the universe, it wouldn’t be homogeneous. It seems I am late for the party. Some people may say that the CMB radiation came from an extended source (i.e., the whole universe) and was of limited duration (e.g., about 100,000 years around t=380,000 years). What confused me is the sayings such as ‘big bang happened everywhere’ and ‘if the universe is infinite now, it was infinite at big bang’. So potentially, the source of CMB radiation could be everywhere in an infinite universe. Your thoughts? I think whether or not the universe is infinite is something we can only speculate about. We can only say that the initial hot dense state we refer to as the big bang happened everywhere at the same time within the observable universe. Although cosmic inflation, if it took place, implies that the conditions that led to the CMB are far broader, probably by numerous orders of magnitude. I am not concerned with whether or not the universe is infinite. I can understand that ‘big bang happened everywhere’ will avoid the ‘center of the universe’ problems and will simplify mathematics of some theoretical models. Can we say anything about the size of the CMB source at t=380,000 years? (That’s after inflation already.) This is relevant to the following question: “Shouldn’t the CMB radiation have all passed us by now” because of the finite extent and limited duration of the source? Can you point me to some materials related to ‘the big bang happened everywhere at the same time within the observable universe’? How about outside the observable universe? Is the radius of the observable universe related to the scale factor a and/or the ΛCDM model? It seems clear that recombination, the effect that generated the CMB, happened everywhere in the observable universe, at least. The CMB is constantly passing us by. The CMB we’re seeing now was generated by matter that is now 46 billion light years away. The CMB generated by our own local matter would be currently viewable by an alien 46 billion light years away. Unfortunately, most articles on the big bang fail to make clarifications that still confuse a lot of people, such as the fact that it happened everywhere in the observable universe, not at any specific location, or that the expansion of the universe is actually the uniform expansion of space itself, not matter spreading out into an empty void. At t=0.38 My, B was 42 Mly away from A and receding at a speed of 0.053c, where c is the speed of light, because of the expansion of space. The CMB flash started from A traveled at speed of c, plus the help from the space expansion along the way, would catch up with and pass by B in less than 50 My. Since it was a flash (of limited duration), B could no longer see the CMB radiation from A afterwards, let alone 13.7 By later (i.e., now) at a distance of 46 Bly. B could still see CMB radiation originated from other locations though. That’s why the extent of the CMB source at t=0.38 My is relevant to the question whether we can still observe the CMB radiation now or in the future. It is interesting to note that at present, B is 46 Bly away from A and receding at a speed of 3.3c. I agree with you that Wikipedia is a good source of information and I have seen some of Ethan Siegel’s postings. The expansion of space actually makes the CMB take longer, much much longer than 50 million years. In fact, the reason it took 13.8 billion years to reach us is because of that expansion. Remember the expansion happened throughout the entire journey of the photons in question. Incidentally, the flash actually probably happened across the entire electromagnetic spectrum, but the reason the CMB is now the cosmic microwave background is because while it traveled through space, its waves got stretched until it was all in the microwave band or lower. In the distant future, it will be further stretched into the radio bands, and then eventually undetectable. Astronomers trillions of years from now will not be able to detect any cosmic background, or eventually even the universe beyond the local group of galaxies, all due to the relentless expansion. Eventually everything outside of that local groups will be receding from us faster than c and thus completely causally disconnected from us. In essence, they will no longer be in the same universe. Please note that the (50 My)-estimate is for the ‘specific’ example we are talking about: A and B were separated by about 42 Mly at t=0.38 My and they were moving apart at a speed of 0.053c (estimated using a cosmic calculator on Fermi Lab Web site). This speed was small (compared to c) because the separation between A and B was small (using Hubble’s Law). I understand about it being about A and B, although I still think maybe you’re missing a crucial point. Using your numbers and examples: A and B are 42 Mly away from each other at t=0.38 My. But as the distance between A and B increases, the amount of space that is expanding between them increases as well, which increases the speed that they’re receding from each other. Using the current Hubble constant, for every million light years an object currently is away from us, it’s receding at an additional 21 km/s or so, with an object 100 Mly away receding at around 2100 km/s and an object 200 Mly away receding at around 4200 km/s, etc. So the rate of separation between A and B is constantly increasing. It may have started at .053c, but it would have been much higher at t=1 My, higher yet at t=50 My, and far higher at t=1 By. As you noted, it’s increased to well over c at t=13.8 By. That’s why it took 13.8 billion years for B’s emitted radiation to catch up to A. 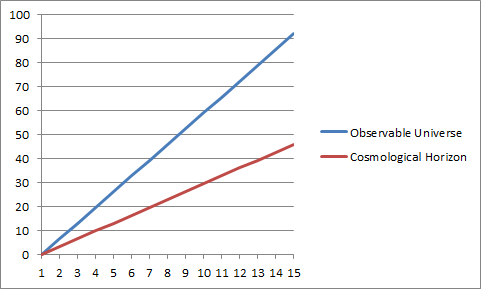 Of course, with the recession now greater than c, any light emitted from B at t=13.8 By will never reach A, or vice versa. They are now outside of each other’s Hubble sphere, causally disconnected from each other, with only their ancient emissions now able to affect each other. This is one of the concepts in cosmology I have been struggling to grasp. Before the recombination epoch, the universe was full of photons. Its number was many orders of magnitude higher than the combined number of hydrogen and helium ions, and electrons. Around t=0.38 My, the temperature of the universe cooled down to about 3,000 K, ions and electrons combined into neutral atoms, and photons (i.e., the CMB photons) started to travel freely in the universe. This was a one-time event and no ‘new CMB photons’ have been emitted since. As you put it: ‘releasing a pent-up store of photons, causing an enormous universe-wide flash’. We are now seeing these ‘relics of the big bang’ coming to us from all directions. (2) Some of them pass by us and the rest can no longer reach us because of the expansion of space. In either case, this suggests that there will be an end to the CMB at our location. (2) is the likely scenario. The expansion of space will continue to stretch the wavelengths of the CMB, eventually turning it into the cosmic radio background, then the cosmic extremely low frequency background, then ultimately, the cosmic undetectable background. (1) could only happen if recombination took place in a finite region of space whose edge we will receive signals from before (2) happens. This would raise the question of what is beyond that edge. It would likely manifest as one side of the CMB sky going dark, and would be a very strange event. Yeah, this is again an area where most science communicators don’t do a great job. Science documentaries compound it by often showing a tiny glowing point surround by darkness, and then a visualization of it blowing up into our current universe. Brian Greene once noted that sometimes you have to start with an inaccurate picture to begin getting an idea across, and then clean it up afterward. The problem is that too often the cleanup part often doesn’t happen. Here’s the cleanup. When they talk about a tiny point, what they mean is that what is now the currently observable universe, all 92 billion light years of it, was once compressed into a tiny extremely dense and hot point. But that tiny point was surrounded by equally dense and hot space. We have no idea how big the overall compressed hot universe was at that time, just as we have no idea of its ultimate size today. In both cases, it might have been infinite, with today’s universe just having a much lower density of matter than it did in its earliest stages. In Nobel laureate Steven Weinberg’s book on the beginning of the universe, The First Three Minutes, he wrote, “I cannot deny a feeling of unreality in writing about the first three minutes as if we really know what we are talking about.” I guess we just have to take what we got for now and wait for future developments. Thanks for all the discussions. I enjoyed it! The answer to the suggested “variable speed of light” and the explanation to the “horizon problem”. An idea that is gaining strong popularity is that the speed of light was much faster in earlier times and has actually been slowing down… this in order to explain the temperature homogeneity of the universe plus other perceived problems. Let’s get one thing straight, according to me there’s only one absolute speed of light which is operative in the absolute frame, whereas there are relative or variable speeds of light that operate in all other frames. However what this new theory is trying to advance is that the actual “absolute” speed of light is in itself variable! The main proponents of this theory are Joao Maguerijo from Imperial College and Niayesh Ashfordi from the University of Waterloo. One of the main issues besides the very stable temperature all over the universe, appears to be that apparently the visible universe has a horizon of about 47 billion light years when including the expansion of space, however the diameter of the “cosmic microwave background” appears to be about 27.4 billion light years. However all of this ignores one of my biggest discoveries, and that is the principle of physiological time. Basically as I’ve outlined all over my website, as the universe expands and grows, the physiological metre becomes larger and physiological time actually slows down… so naturally the speed of light will appear to have drastically been reduced! Yes the speed of light was much faster in our remote past, but only because of my physiological principle in action, and not because one of the most basic and important constants of nature is at all capricious! 510 The slowing of physiological time ’causes’ the redshift observed from far away stars. Written by Frank Pio Russo, Posted : September 27, 2015. Slight Update – June 14 2018 – Basically as the universe grows bigger the there sentient beings would be dealing with a much longer second as well as a much bigger physiological meter. But in terms of absolute time and absolute distance, light always travels at the same pace in the same material and for a given temperature.